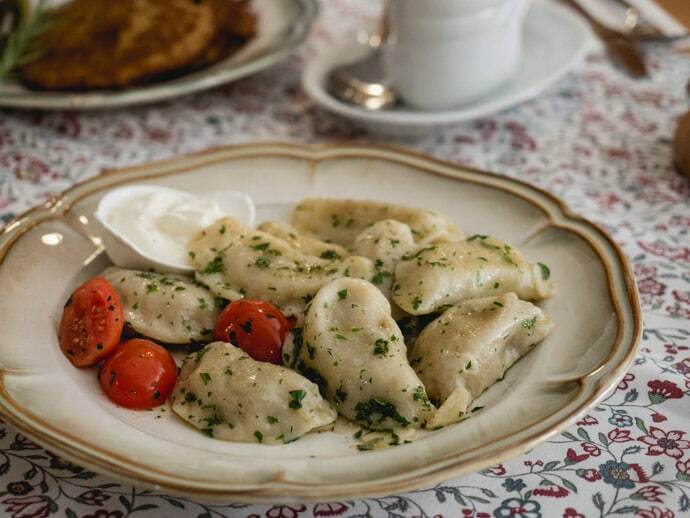 If there’s one dish you have to try when you’re in Poland, it’s the delicious filled Polish dumplings, Pierogi. 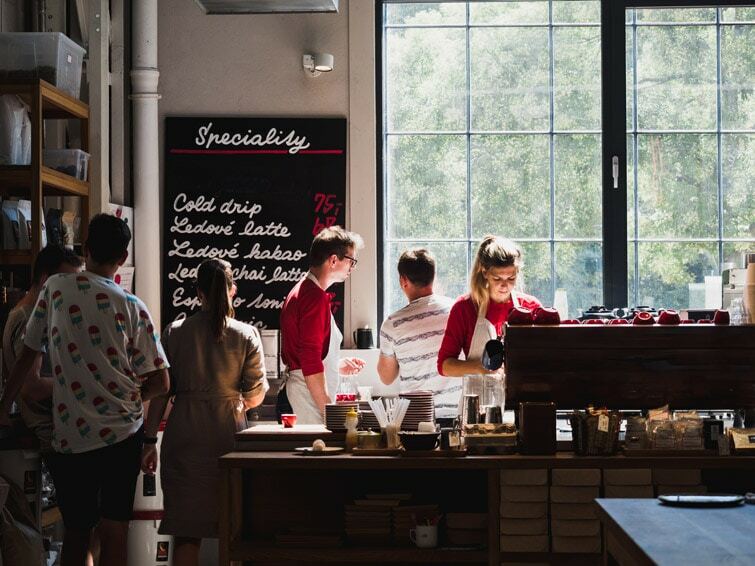 In fact, I’m sure you will find it difficult to avoid them, as you can find them everywhere, from Polish milk bars to some of the best restaurants in Krakow. After spending 5 incredible weeks in Krakow, we definitely ate our fair share of pierogi. 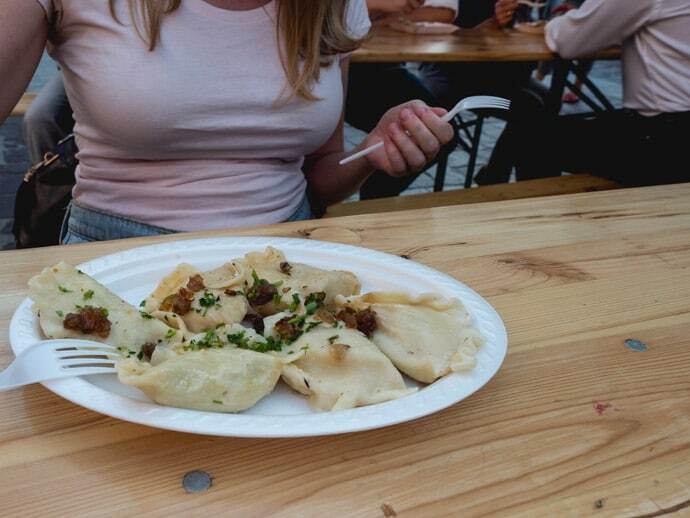 So we wanted to share our picks for where you can find the best pierogi in Krakow Poland, so you can try these on your trip to Kraków. 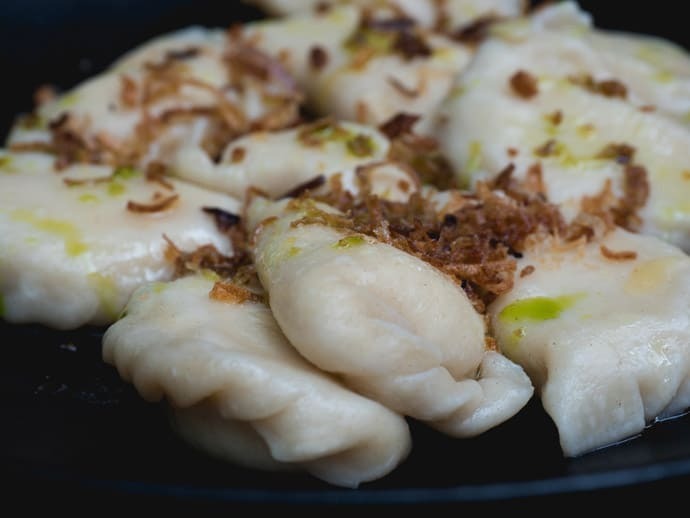 Pierogi are boiled or fried Polish dumplings made from unleavened flour and come with a savoury or sweet filling. They are usually served with caramelised onions on top and some sour cream. The most common filling would be the Pierogi Ruskie, which has potato, onion and quark cheese. Although it implies it’s a Russian Pierogi, it is not actually Russian in origin. It is said to originate from an area called Ruthenia, which was also known as Rus, now a part of Ukraine but at one point was a part of Poland. But there is such a wide variety of fillings, from cabbage and mushroom to meat, to blueberry and everything in between. My favourite overall was Pierogi Ruskie, but we had some delicious unique flavours too. Przystanek Pierogarnia is a tiny little store on a corner, with a couple of bar seats inside and a few seats outside. It’s pretty casual and the perfect place for a no-fuss lunch. 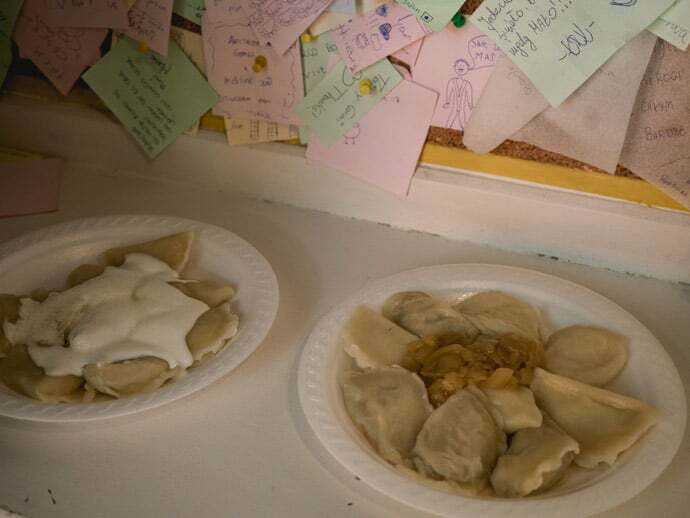 Here we tried the savoury Ruskie pierogi, and the sweet quark cheese and cinnamon, both were delicious. 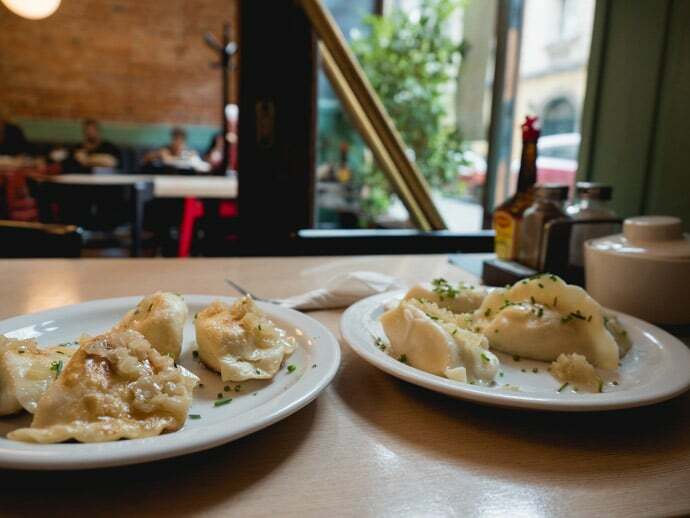 These are some of the best pierogies in Krakow for affordability and casual atmosphere. The first meal we had when we arrived in Krakow was pierogies at Pierożki u Vincenta, otherwise known as Mr Vincent Pierogi. This is a small restaurant in the Kazimierz district (Jewish Quarter) with Vincent Van Gough inspired artworks and interiors. It has a really homely and cosy feel to it. The pierogi menu here is quite large, so either take your pick or if you’re overwhelmed, stick to the classic Ruskie. We also learned an important pierogi lesson. We were so excited to try these pierogies that we popped them straight into our mouths without comprehending that they may be too hot, and they were boiling! Be patient with your Pierogies. 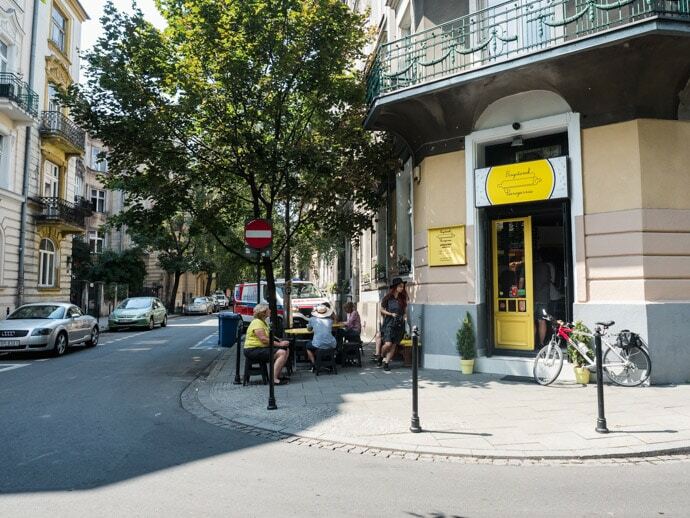 Besides eating pierogi, another great thing to do in Krakow is eat at a traditional milk bar, where you can try a range of traditional Polish food. As milk bars go, Milkbar Tomasza is actually more modernised, but they definitely serve up some tasty dishes. Here we tried the Ruskie pierogi both boiled and fried. I have to say fried was my favourite, but both were delicious. The pierogi here were a lot bigger than at other places we tried them, so keep that in mind when ordering. 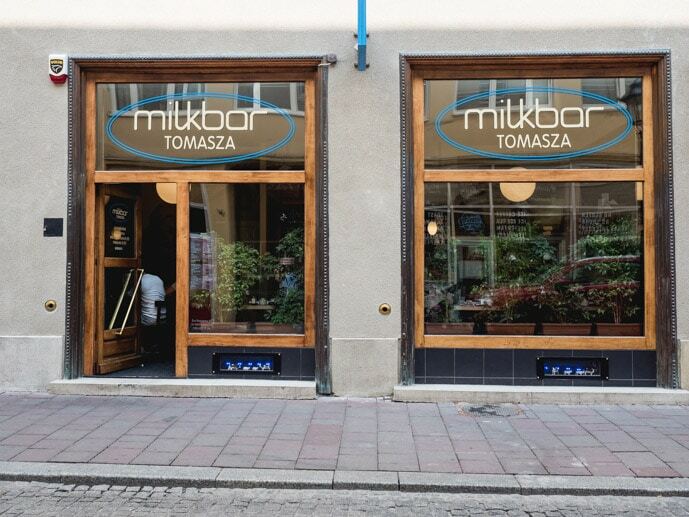 Milkbar Tomasza is also conveniently located in Krakow Old Town, so it’s easy to fit into your Krakow itinerary. 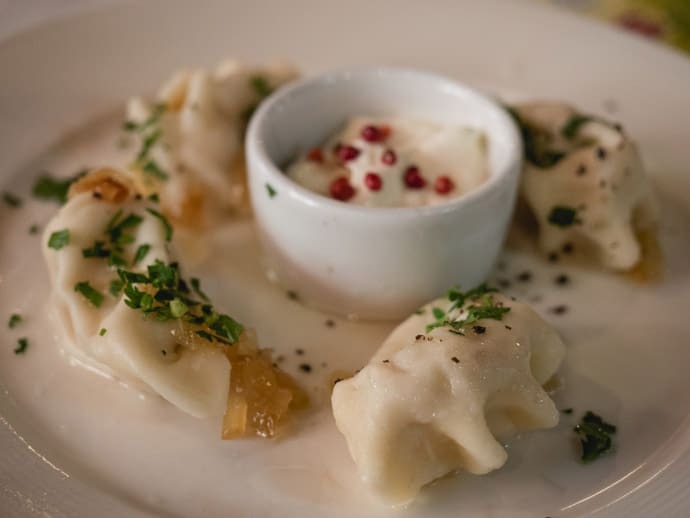 If you’re looking for a fancier version of pierogi, look no further then Pod Aniolami restaurant. 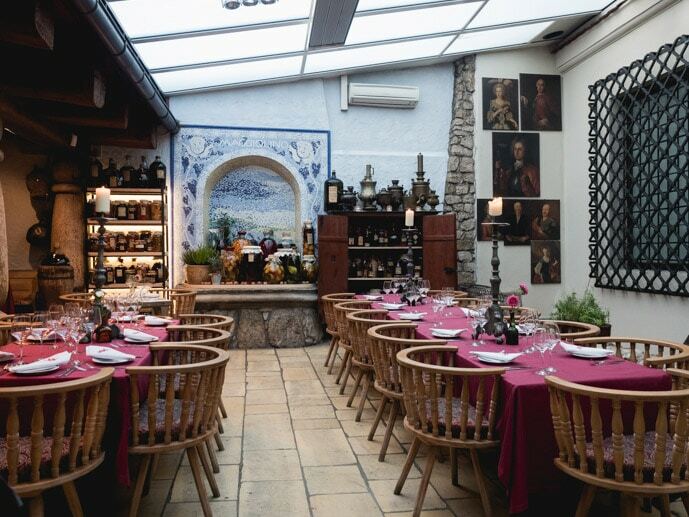 This stunning restaurant will make you feel like you have stepped back in time with its historical 13th-century interiors. 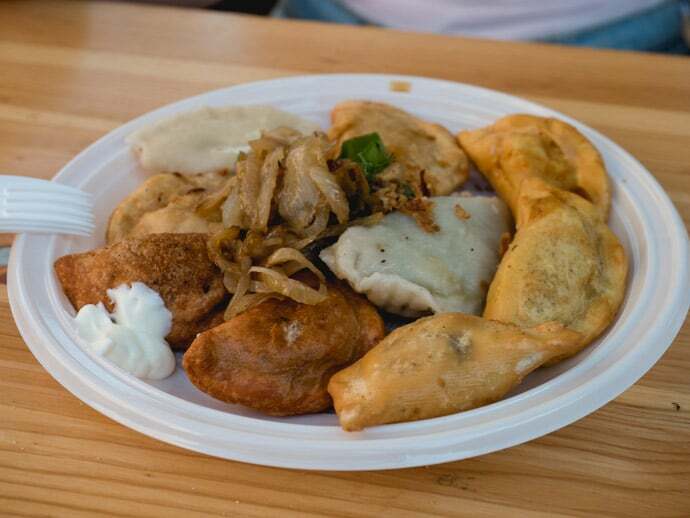 Here we recommend the mixture of pierogies, including venison, mixed meats, cabbage and mushroom, and of course Ruskie pierogi. Our favourite was the cabbage and mushroom pierogi. The pierogi here were full of flavour, and a little crispier than some with an extremely thin dumpling skin. Definitely one of the best pierogi in Krakow in a restaurant setting. 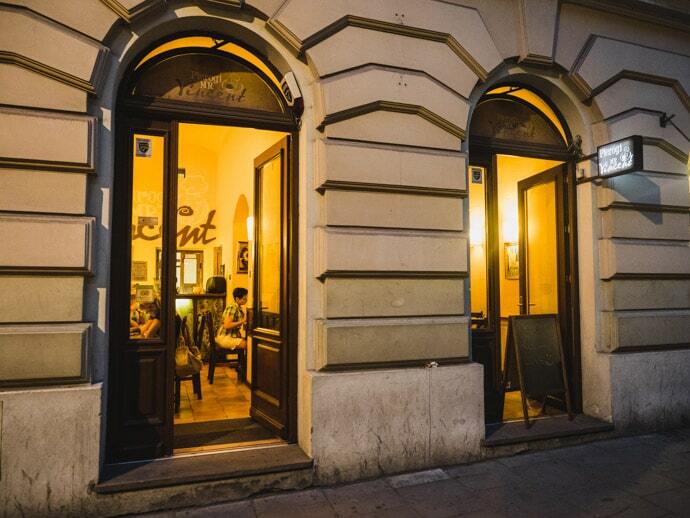 Pod Aniolami Restaurant is located in Krakow Old Town. Another beautiful restaurant setting to enjoy your pierogi. 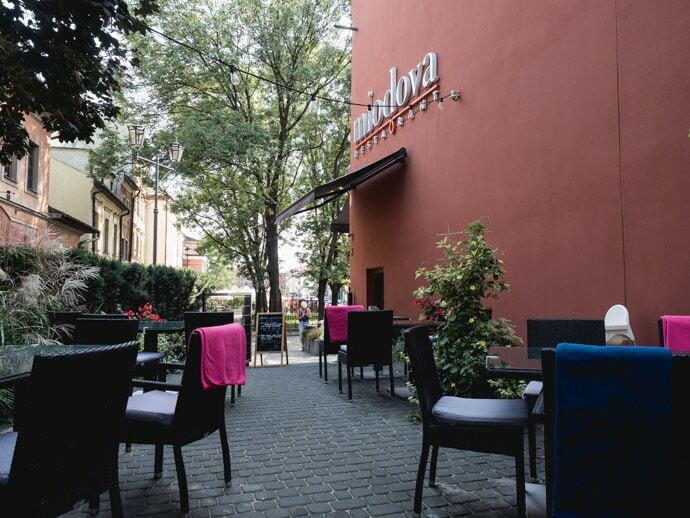 Miodova is located in the Kazimierz district, where you can sit inside or outside in the beautiful courtyard. Here they serve the traditional Pierogi Ruskie, in a more refined way, but still with all the flavour. We loved the texture of the pierogi skin here. 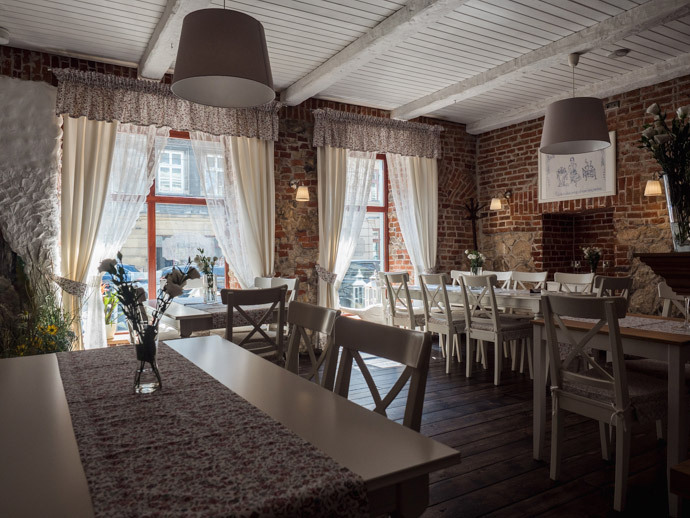 This is a beautiful cosy restaurant with friendly service in the Podgórze neighbourhood. Here their speciality is goose meat, but they also have a range of delicious traditional Polish dishes, including pierogies of course. 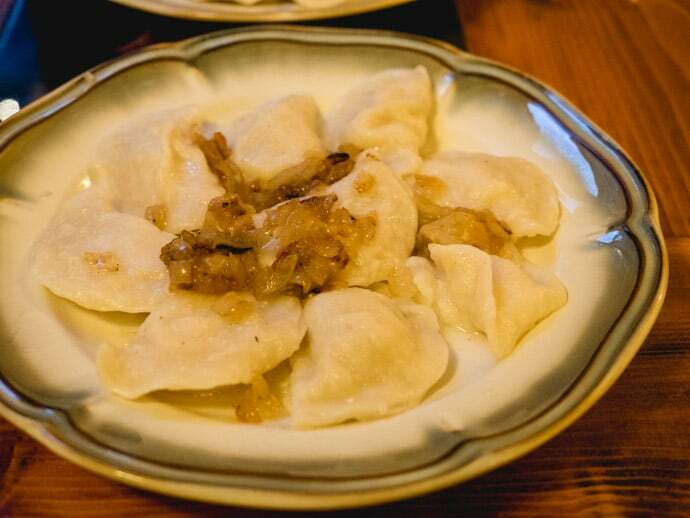 Here we tried the pierogi with goose meat stuffing, and we loved the flavour of the filling. 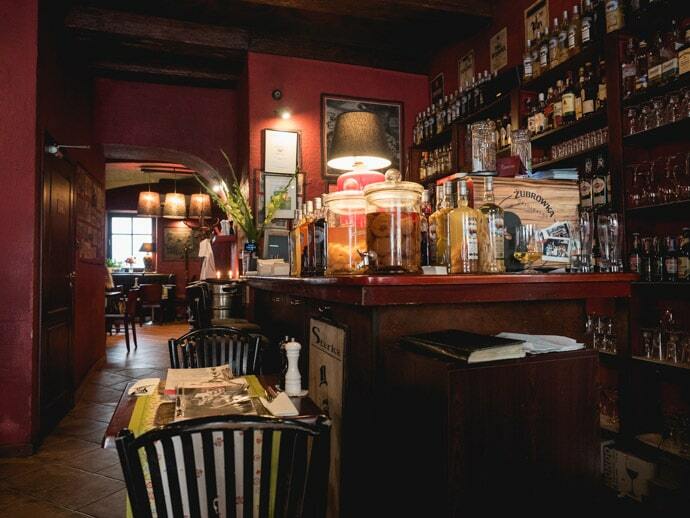 Starka Restaurant is a cosy restaurant and bar in the Kazimierz district, otherwise known as the Jewish Quarter. The food here is delicious, and we loved the pierogies. The only downside is that you only get four pierogies per portion and you’ll pay a little more for them too. Starka restaurant is also a great place to try some homemade flavoured vodka. Robimy Pierogi is actually a food truck with a fixed location that we first tried at the Pierogi Festival. 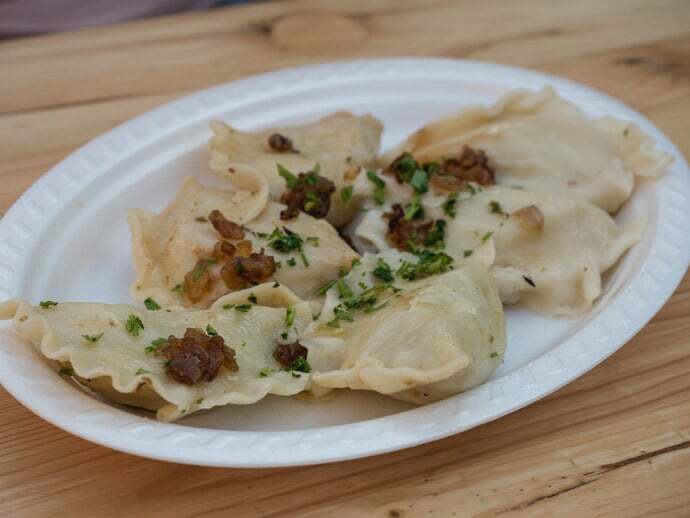 These were some of our favourite pierogies at the Pierogi Festival. They only use natural ingredients and the flavours are so tasty. We tried traditional Ruskie, pulled pork, beef and chicken with zucchini and pesto, some fried, some boiled. 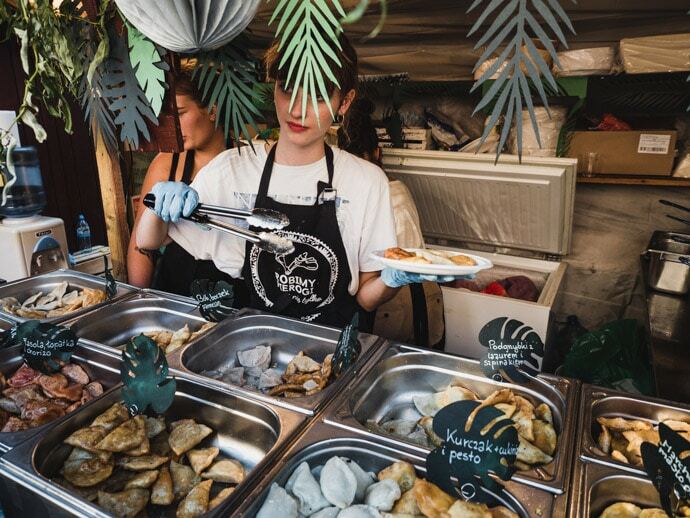 Each year in Krakow there is a Pierogi Festival, where all different venues come together to serve up Pierogi of all types. There is also a competition for the best pierogi of the year. It’s a great way to be able to try lots of different types and flavours of Pierogi in one place. We loved the Pierogi from Robimy Pierogi and Sekret Smaku. The atmosphere is buzzing and it’s just a nice evening out. 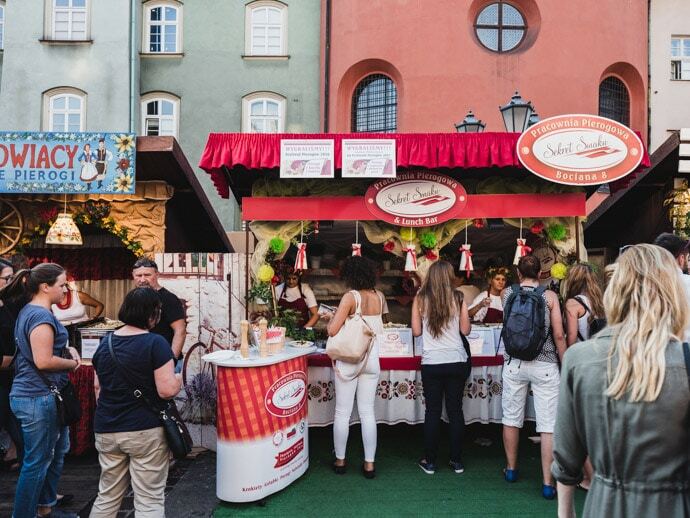 The Pierogi Festival usually takes place in the beautiful Small Market Square (Maly Rynek) in August. 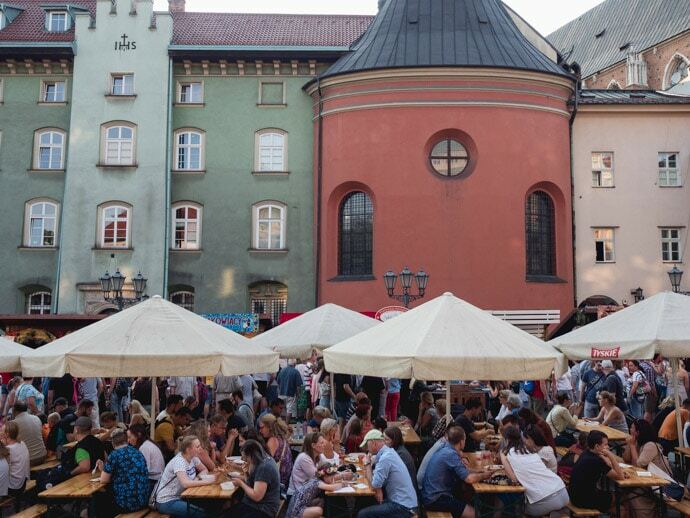 So What is The Best Pierogi In Krakow? 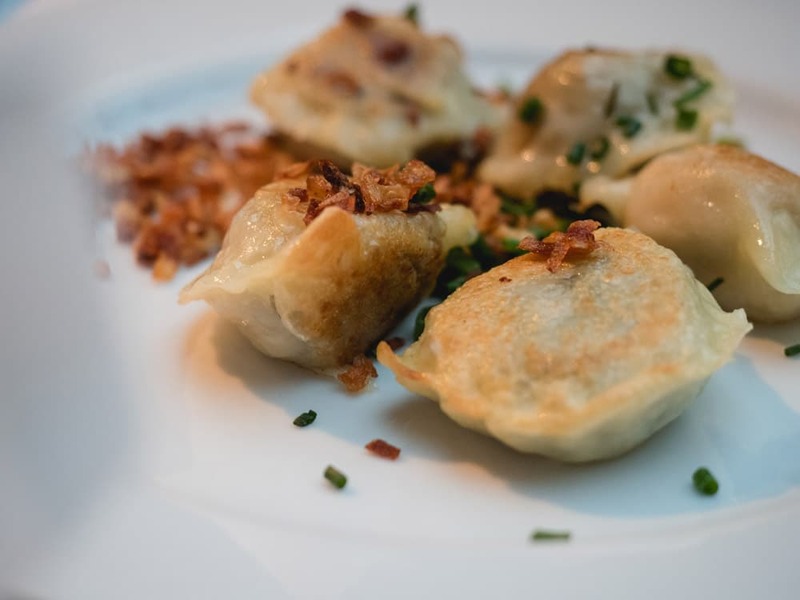 So now you know all of our favourite picks for Pierogi from our time in Krakow. But which one is the best? Honestly, they are all a little different, and I think you can’t go wrong at any of the above places for pierogi. 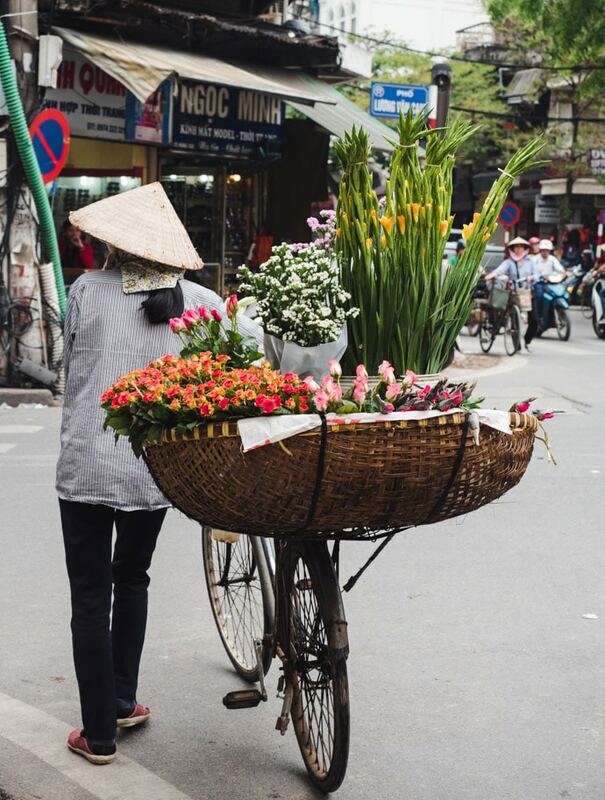 I would choose based on the overall experience you want, from casual eats to fancy restaurants. But, having said that, I also know how hard it can be to choose off a list of many when you may only have time for one or two places. So for a fancy restaurant pierogi pick, I would choose Pod Aniolami Restaurant, and for a casual pierogi pick, I would choose Milkbar Tomasza. But honestly, all on this list are delicious! 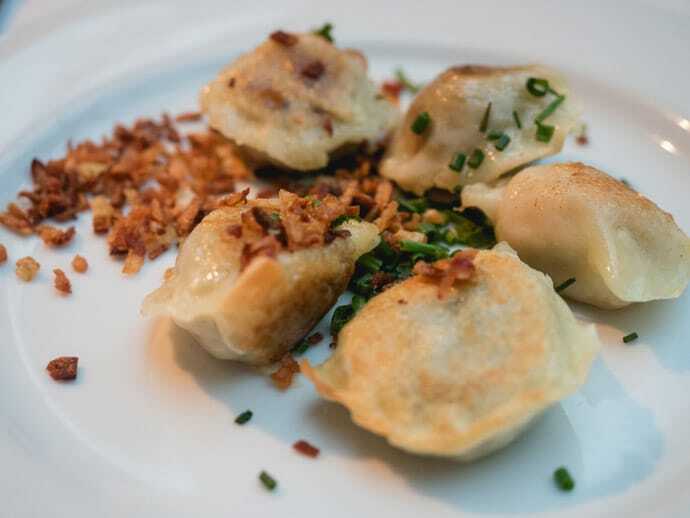 What’s your pick for the best pierogi in Krakow?